James Franco Is All Kinds Of Creepy In The Trailer For Mad Max-Wannabe Film Future World! Hellboy IS Replacing Ed Skrein With An Asian American Actor! Paris Haute Couture Fashion Week Is In Full Swing — Check Out The Best Looks From Kendall Jenner, Bella Hadid, & MORE So Far! Chrissy Teigen Leads Celebs In PERFECT Recreation Of Michael Jackson’s Beat It Music Video For Lip Sync Battle Season 3! Watch! Resident Evil: The Final Chapter‘s First Trailer Is Non-Stop Action — PLUS More Video Game Movies Ranked From Worst To Best! 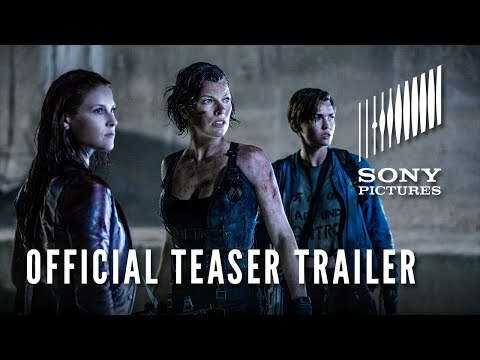 Milla Jovovich, Ruby Rose, & Ali Larter Get Silly On The Set Of Resident Evil: The Final Chapter! Will They Join The Top 20 Most Badass Women In Film?? Milla Jovovich Shares A Wonderful And Beautiful Moment From Her Daughter Dashiel’s Baptism! See It HERE! Cara Delevingne Lands Another Movie! Find Out How She’s Following In Milla Jovovich’s Fifth Element Footsteps HERE!